I’ll be on a short break this week and then back to blogging on July 7th. I’ve been doing many bucket list experiences lately… French dining, trapeze and now an air show! Here is a picture of the type of planes we saw. I recommend going to visit the Fagan World War II Museum in Granite Falls, MN. Here is the latest news in my world. 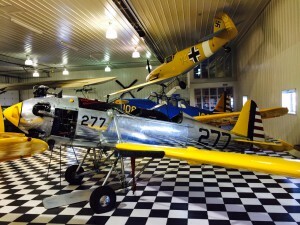 My father in law was here last week and we went to the Fagan WWII Fighter Museum and Air Show. Wonderful show. I recommend all Minnesotans make the trip to Granite Falls to take in this show once per year. The show included fighters, war re-enactments and wonderful aerostunts. Check it out next year and also go to the museum anytime to see their displays. For news that doesn’t matter..Kim Kardashian is having a boy in December and Jake Lloyd was arrested after a high speed chance in South Carolina. He is the boy who played Anakin Skywalter. I wanted to let you know about a great new book. Educator and writer, James Rains just released Afognak. It is a biomedical thriller set in the wilds of Alaska. Check it out on Amazon or at www.JamesRains.com. 1. Grey by EL James: It is set to be released on Thursday, June 18. 5. Audrey at Home by Audrey Hepburn’s son Luca Dotti. More titles to come on Thursday! Today is my first step to possibly getting my own radio show. I’m doing a demo in Northfield for a program called Metro Live! I’m going to have fun with my guests and we will talk about food, books, news and anything else that strikes our fancy. I’ve always wanted to either be a columnist or a radio show host. I love to discuss current events from movies to books to celebrity gossip to food. That is what this should will be all about. To check out the radio station go to www.kymnradio.net. Also, as a follow up to my trapeze experience last week, the Twin Cities Trapeze Center is having a show this Saturday at 8 pm. Many times people will talk about their bucket lists. I want to travel to Australia. I want to go bungee jumping. I want to see Paris. However many times people do not just do it. I recommend just doing it. It can be very stressful and the control is not your own but the payoff is unreal. 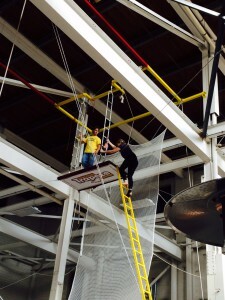 Last weekend I participated in a trapeze lesson in St. Paul. I’m bruised sore and have a sprained ankle but I did it! I highly recommend trying new things. Get out of your comfort zone and try! Here is the proof. I’m climbing the 22 foot ladder to the trapeze platform! We aren’t afraid to take risks here at Lien PR. I’m a little nervous and a lot excited. This Saturday morning I will be flying on the trapeze. Last Christmas I made a remark about wanting to run away to the circus. My husband listened and bought me a gift card to a trapeze class. Yeah! I think! I go Friday morning to try my hand at running away to the circus. Here is the link for anyone wanting to do the same. Why is failure a good thing? That is the topic Mehdi Toozhy tackled in his blog featured on the Changing Behavior Network. Mehdi’s book, Keys to Success at School and Beyond is a manual for helping your child or anyone through the tough times in school and life. Toozhy was born in Iran but left home at age 13 to attend school in Europe. He had to learn many life lessons very quickly. Go to www.MehdiToozhy.com for more information. Also, this week USA put out a great article all about publicist. They focused on publicist in LA with the stars but it drove home the point that the life is not glamorous.